Beautifully engraved certificate from the Philadelphia Transportation Company issued in 1943. 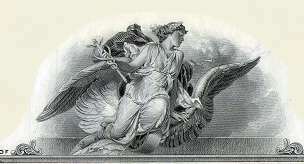 This historic document was printed by the American Banknote Company and has an ornate border around it with a vignette of an allegorical woman with wings. This item has the printed names of the company's voting trustees and is signed by their agent and is over 57 years old. Prior to 1913 the City of Philadelphia's relations with public transit companies were administered through the offices of the City Surveyor and the Bureau of Highways under the general supervision of Councils' Committee on Street Railroads. 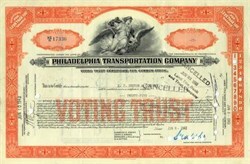 In that year, under an Act approved on 9 May 1913, the Department of City Transit was established to coordinate the control of all transit facilities located within the City with especial regard to the contract of 1907 between the City and the Philadelphia Rapid Transit Company formed in that year as an amalgamation of the many transit companies that had existed independently until that time. Philadelphia's first PCC trolleys arrived in 1938, an order for twenty for route 53 by the Philadelphia Rapid Transit Company, which became the Philadelphia Transportation Company in 1940. These original PCC cars were augmented by 130 more PCCs in 1940-41 and 110 in 1942. All the prewar PCCs were similar in appearance. They had the prewar PCC body, which was simpler than the one used with most postwar cars. All the prewar cars also had air-electric braking systems. They came to be known as "air cars." All were built by the St. Louis Car Company. One prewar PCC remains in Philadelphia: car 2054, built in 1940. After the Second World War, Philadelphia received its next large shipment of PCC cars in 1947 and 1948. These cars were also built by the St. Louis Car Company, but differed from the earlier ones in that they had the postwar PCC body, which was modified with such features as standee windows and a more acutely angled windshield to reduce sun glare. In addition, the postwar cars had all-electric braking systems. They became known as "all electrics." Around 55 of these cars remain in Philadelphia today. In 1955 the PTC purchased 90 used PCC trolleys from St. Louis (50) and Kansas City (40). The St. Louis cars were from 1940, and were built to modified specifications which made them difficult to operate in Philadelphia. They did not fare well, and were all retired within a few years. In contrast, the Kansas City cars did very well in Philadelphia. They ran regularly until the early 1980's. Only one ex-Kansas City car remains in the area. It is part of the Buckingham Valley Trolley Association's collection. The last PCCs to arrive in Philadelphia were cars purchased by SEPTA in 1976 from the Toronto Transit Commission. They were brought here to replace trolleys lost in the 1975 fire at the Woodland Carbarn. This shipment included trolleys, built by Pullman-Standard, that originally ran in Birmingham, Alabama. They went to Toronto in 1953, where they ran until they were sold to SEPTA in 1976. In addition to the Birmingham cars, Philadelphia received from Toronto a few more PCCs that originally ran in Kansas City. All the ex-Toronto (Birmingham/Kansas City) cars were retired by the early 1980's. Of all the PCC trolleys that ran in Philadelphia, around 55 remain. They are all from the 1947/48 order, and it is these cars that are featured in the photographs on the previous page. They last operated regularly on routes 15, 23, and 56, until these lines were "temporarily" suspended by SEPTA in 1992. Of the remaining PCC cars, six or so have been restored and operate occasionally in special service (they are also available for charter). The rest make up the "mothball" fleet, and sit stored at various SEPTA properties, including the Luzerne Depot.